As August winds down, and the summer wraps up, it becomes a pretty hectic time of year for most people. It’s time to get the kids ready to go back to school and a lot of people try and squeeze in one final vacation of the summer. That was the case two weeks ago when I headed to the Shonto for one final exotic hunt of the summer. I had 2 different groups coming in looking for axis and blackbuck and I was really looking forward to the hunts. 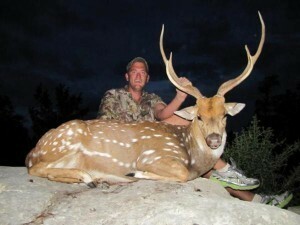 Exotic game hunting in Texas has become quite a trend and we can offer such a variety of animals. Ivan, Ron, Ronnie and April showed up Friday afternoon and after getting them situated in the Creek House we headed out to start the hunt. With temperatures in the mid 90s I knew the last 30-45 minutes of daylight would be the best hunting. As the sun faded, and temperatures started to cool, the animal activity really picked up. We saw some really nice axis, but since it’s fairly late in the prime axis season (axis are an exotic in Texas and can be hunted year around, but we typically hunt them from May through August and that’s what I mean by the “axis season”) they had gotten pretty smart and weren’t sticking around long for us to get much of a look at them. Right at last light we got on a herd of axis and Ron was able to locate a buck he liked. With light fading fast it was a tough shot, but Ron got the job done and connected with this nice axis buck. The next morning we were back at it at first light, but once again we just couldn’t get on any of the bigger axis bucks. We were seeing a lot of animals, but just couldn’t seal the deal so we decided to wrap up the morning hunt and break for lunch. After lunch and a little fishing and swimming in Turtle Creek we headed back out about 5. A little cloud cover had rolled in and it was much cooler than the previous afternoon and we were seeing a lot more animals than the previous afternoon. 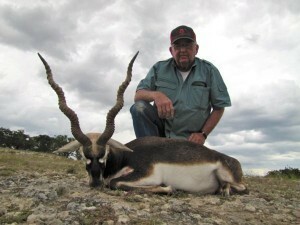 Having seen quite a few blackbuck and axis by this point Ronnie decided he wanted to try and get a nice blackbuck and it didn’t take us long to get on one of the bigger blackbuck I had been seeing. 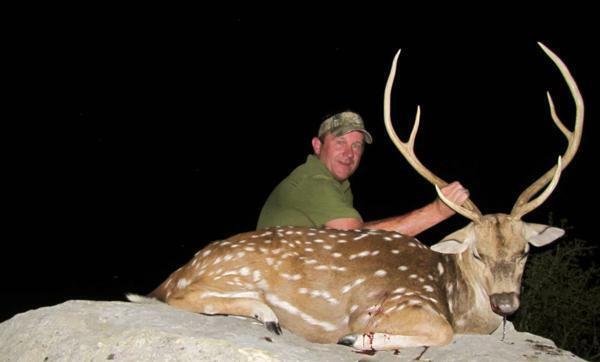 As the blackbuck turned broadside, Ronnie squeezed the trigger and the blackbuck dropped. It was still early in the afternoon, so after taking pictures and dropping the blackbuck off at the walk in cooler we headed back out to try and find an axis for Ivan. We had been seeing a lot of axis in one particular location on the ranch and headed back that direction. As we came over the hill I could see a lot of axis out grazing. There were several nice axis bucks in the herd. All they needed to do was cooperate with us. It took us a while to get set up where I thought the axis might wonder past us, but once in position we had axis right on top of us. Unfortunately we got busted by some of the axis does and younger bucks and all the axis blew out of the area and started to run up the hill. Ivan and I ran towards a cross fence hoping they might stop and we would get a shot. Right as they were about to disappear over the hill they stopped to take a look back down the hill. That was all the time Ivan needed for a shot and this great axis buck was his. After seeing all the animals everyone else was shooting, April decided she wanted to get in on the action so Sunday morning we were off to try and get her an axis or Texas dall sheep. With just a morning hunt left, we couldn’t find April an axis so we decided to concentrate on the Texas dall. Once we found the Texas dall, April did the rest and this huge, 33-1/2″, Texas dall was a great way to wrap up an awesome hunt. It was close, but we got it done and they were all able to head back to Midland to finish getting the kids ready for school and wrap up the summer. We had a lot of laughs and a really great hunt and it was a pleasure getting to know everyone and hunt with them – exotic game hunting in Texas at its best! As they headed back to Midland I had to get everything cleaned up and ready for my next group. Mike and Tyler would be arriving in a few hours and after harvesting 4 animals in 2 days I had a lot to catch up on and a short time to do it. No rest for the weary…. If you want to get some exotics, aoudad or whitetail for your collection, contact me now and we’ll see what we can arrange!